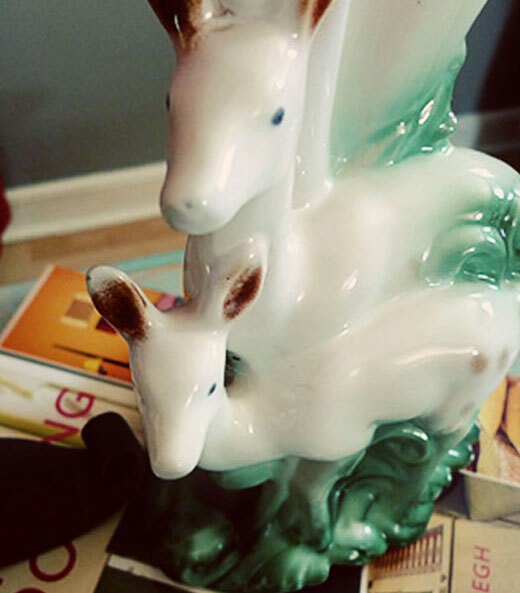 I found this vase at my favorite antique store over a year ago, and fell in love with it's kitsch-y charm. 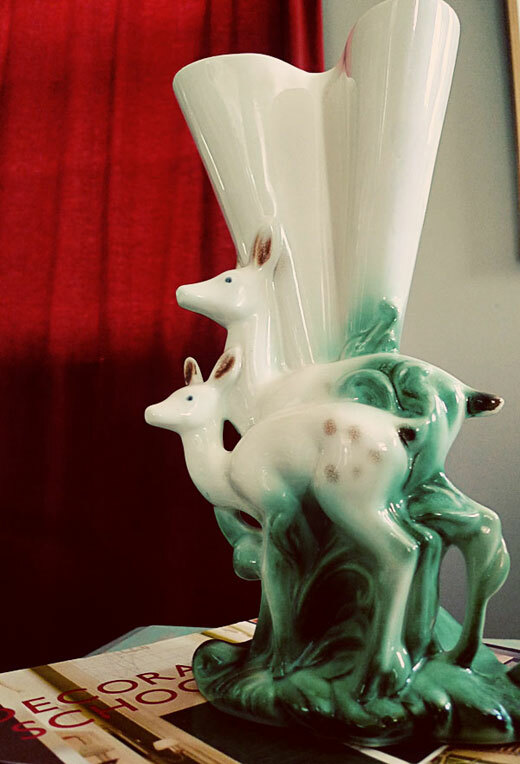 However, the price tag was not to my liking (kitsch-y as it is, it is also rare and high-quality), so I contented myself to visit the vase off and on. Apparently, no one else was so taken with this unusual specimen, so the price was gradually reduced. But I still held out, and even as the store was in the final weeks of it's store closing sale, I did not waver on my price point. (I point this out only because I don't usually exhibit such strong resolve) I didn't end up taking home the vase until the day of the actual store closing, for a mere one-fifth of the original price. It has a happy home for now on my bookshelf, but I envision it someday on a white marble mantel, with other aqua treasures to keep it company. i am esther ellis' sister. i don't know who you are but i love you and hate you all at the same time. i love your blog and everything you have written and baked but i hate you for being so talented. (i'm not) i picture you talking with a british accent so i hope i never meet you because then it will dash this into a million pieces. i posted the link to your blog on my fb profile. i love it. keep writing and i'll keep living vicariously through you. Hi Ruthanna! You are too sweet, thanks for making me laugh! I don't think I'm exceptionally talented, I'm just not afraid to try things (also, I don't usually post about my failures). And I hate to dash your dreamy vision of me... but I don't have a British accent... though I would sure love too! What is it about British accents that are so endearing? I once had a British client and I would call his voicemail just so I could hear it. Wish I still had that number.